There are many different tools produced specifically for bonsai work, and the enormous selection can be quite overwhelming for a begging enthusiast. Many of these tools are only used for specific tasks and as a result, you might not need to use them. We recommend that as a beginner you purchase a starter set that will include basic tools. Please understand though that you will get what you pay for (cheaper tools are not very durable). If you are looking for a beginner set, please see the two sets below which are offered on Amazon. One is a cheap, but great starter set and the other is a professional and more expensive set. 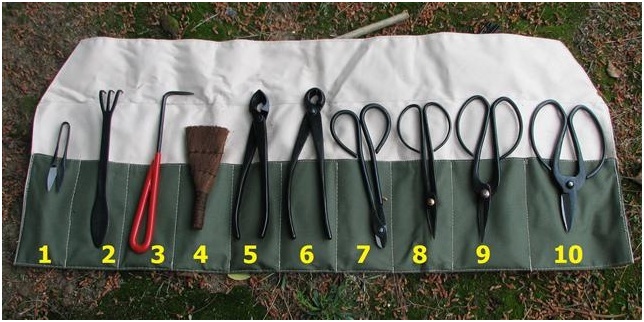 In this section we will discuss the uses of the most common tools. 1. Leaf Cutter -used for clipping individual leaves. 2. Rake with Spatula -used for pulling apart roots during repotting and raking fallen leaves. 3. Root Hook -used for pulling apart roots during repotting. 4. Brush -used for cleaning areas such as top of soil and branches from debris. 5. Concave Branch Cutter -used for removing larger branches close to trunk. 6. Spherical Knob Cutter -used for removing larger branches close to trunk. 7. Wire Cutter -used for cutting wire on wired trees so it can be removed easier. 8. Long-handled Shear (Small) -used for general pruning but great for hard to reach places. 9. Trimming Shear (Medium) -used for multipurpose pruning. 10. Root Shear (Large) -used for thick branch pruning and trimming roots.